AMRO Director Junhong Chang delivered the opening remarks at the ATFF 2016. Ladies and gentlemen – Good morning! 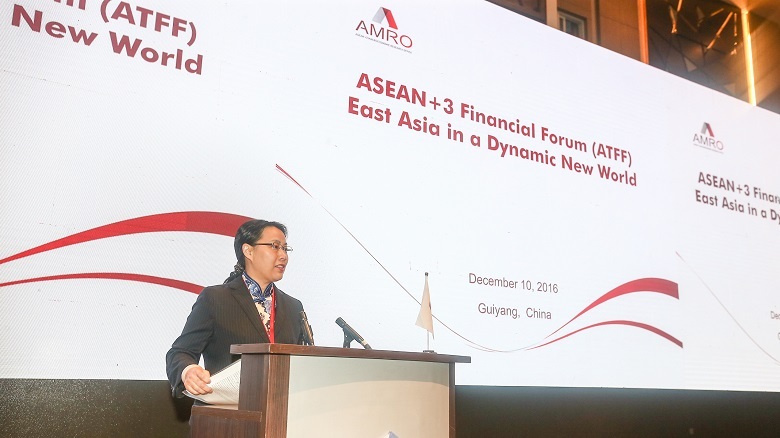 I am very delighted and honored to welcome you all to AMRO’s first ASEAN+3 Financial Forum (ATFF), held back to back with the ASEAN+3 Finance and Central Bank Deputies’ Meeting in Guiyang. Our gathering today is a testament to regional financial cooperation in East Asia, galvanized by the Asian Financial Crisis almost two decades ago. Since the crisis, the region has learnt that members are stronger and more resilient if they stand together, and regional financial cooperation has progressed steadily and surely. The commitment of ASEAN+3 economies to enhance regional financial cooperation has led to the establishment of AMRO, which is envisioned as an independent, credible and professional regional organization acting as a trusted policy advisor to members in the region. At the same time, the world is now facing challenges to the fundamental principles underpinning economic and financial cooperation. There is a growing opposition against economic globalization, and against the principle that trade and financial linkages bring mutual benefit to all members. This populist critique of free trade and economic cooperation can no longer be dismissed, and requires a concerted and determined response from policy makers, opinion leaders, economists and academia, including our distinguished speakers today. These important and pertinent issues affecting our region and the world are what the ATFF, as one of AMRO’s new key initiatives, is designed to address. ATFF will provide a flagship platform for ASEAN+3 Deputies, academics and high-level representatives from international financial institutions to brainstorm key challenges and issues relevant to regional economic and financial cooperation. This is a key pillar in AMRO’s strategic priorities to forge partnerships with a diverse group of stakeholders. In the long run, AMRO hopes to become a “regional anchor”, not only to inspire insightful and forward-looking thinking and ideas on regional financial cooperation, but also to facilitate the transfer of knowledge and best practices from where it is available to where it is needed, to enhance individual and organizational capacity and to support member authorities and other parties to make evidence-based and informed decisions. As you can see from the agenda of this half-day program, this year’s theme is East Asia in a Dynamic New World. I have mentioned the growing populist backlash against free trade, and policy uncertainty is accentuated going into 2017 as this agenda is implemented into policy in the U.S. and in Europe. This policy uncertainty is another setback to global economic growth. While East Asian economies continue to trade with and invest more within the region, this cannot completely offset the drag on growth from outside the region. Our economies remain vulnerable to external shocks and contagion through financial and trade channels, and despite the buffers that have been built up in foreign exchange reserves, the region’s resilience will be severely tested. We have with us two panels of distinguished speakers, who will share their views on the regional outlook and policy responses, and the future direction of ASEAN+3 financial cooperation in the very challenging times. In closing, I wish to express my gratitude to all distinguished speakers for joining and sharing with us your insights on these important topics, and to thank all members, especially the Co-chairs, China and Laos, for their diligence, guidance and contributions. I would also like to thank the Chinese government for its generous support for this event through the China Technical Assistance Trust Fund, and the Ministry of Finance of China and Guizhou provincial government for their hospitality and excellent administrative support. Let me also single out two distinguished people who have joined us today: AMRO’s founding Director Mr. Wei and the second Director Dr. Nemoto. My heartfelt appreciation to them for their pioneering efforts and contributions to the institutional groundwork establishing AMRO, and the solid foundation on which they have built for AMRO to grow and thrive. I am confident that the unique views and perspectives that you will bring to the table today will shape a very informative, illuminating and enriching discussion.